'Horror Halloween' begins after sunset - decorations turn spooky and the frights start to come out! Enjoy all of Lotte World's other thrilling rides and attractions! You must show the full voucher to the staff for varification including QR Code, Activity Name, Participation Date. Only showing QR Code will not be accpeted. Available to use only at the day for attractions indicated on the coupon. Present this coupon to the staff in front of the attraction you go on. Not changeable to other attractions even in the case of suspension of service in accordance with the weather conditions. Limited of usage may occur as a safety issue by age, height and health condition. The waiting time may occur for 30 minutes or so depending on the situation. Not permittable to re-issue, refund or resale. 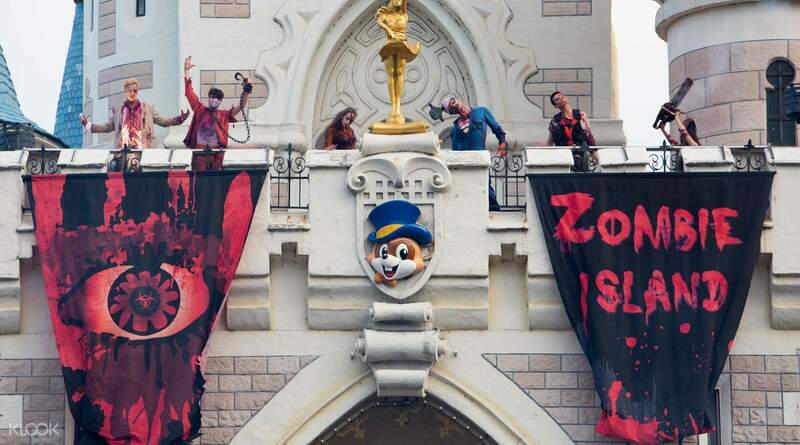 Visit Lotte World, Korea's most popular theme park, from 1 September to 5 November and see it all dressed up for Halloween! Located close to the city center, Lotte World provides visitors with a unique mix of classic theme park rides combined with other indoor amusements. 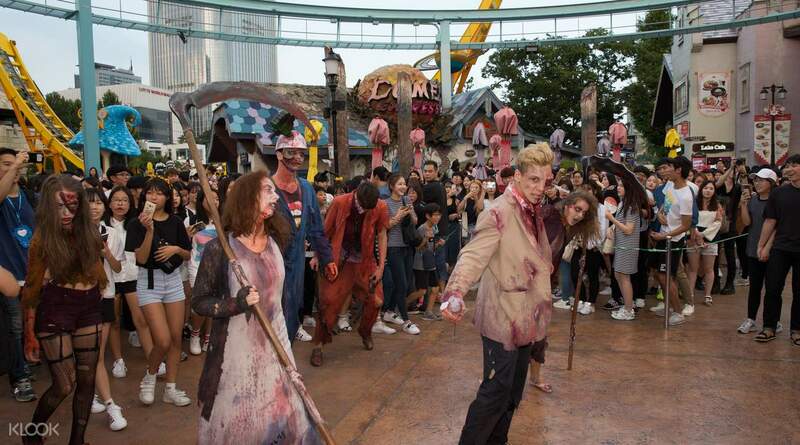 Enjoy all of Lotte World's regular rides and more with the park's various themed activities: kids will enjoy the "Cute Halloween" event before the sun sets, with Happy Halloween parade, themed menus and seasonal merchandise. 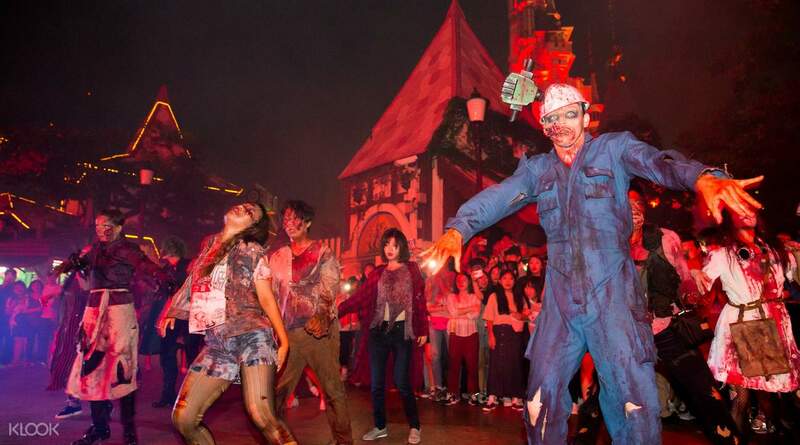 Once the sun sets, the cute goes away and the scare shows up with "Horror Halloween," where you will get to try out horror rides and experience zombies walking around the park. 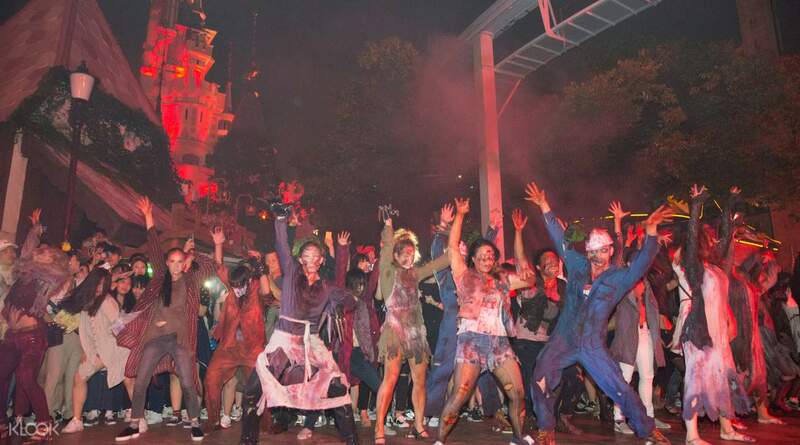 You'll also get a special treat with the Restricted Area M show, where you'll see a truly spectacular Halloween show and get a chance to take photos with zombies! This is an activity that you definitely shouldn't miss this Halloween 2017! Safari World : A child under 100cm should be together with a guardian. Lost Valley : A child under 100cm should be together with a guardian. Getting the ticket was a little bit of a hassle because you can only retrieve it from the other side of Lotte world. It was pretty far and we got lost a few times but the staff was really helpful! After that everything went smoothly. Getting the ticket was a little bit of a hassle because you can only retrieve it from the other side of Lotte world. It was pretty far and we got lost a few times but the staff was really helpful! After that everything went smoothly. Went on afternoon timing, it’s was great! But rides kinda of limited and there is a few level for the attractions. But if you looking for more thrilling and daring rides, should go outdoor and just sit those rides. Confirm you will like it very much. As for tickets wise, go to the main floor (1 level) beside it got one small office beside it. Just redeemed there. Simple and fast. Overall it’s good experience!! :) thanks klook for a cheaper deals! Went on afternoon timing, it’s was great! But rides kinda of limited and there is a few level for the attractions. But if you looking for more thrilling and daring rides, should go outdoor and just sit those rides. Confirm you will like it very much. As for tickets wise, go to the main floor (1 level) beside it got one small office beside it. Just redeemed there. Simple and fast. Overall it’s good experience!! :) thanks klook for a cheaper deals! You need to redeem the ticket at the Lotte World South Gate which is a bit of a walk from the main entrance but once there, everything is a breeze. Love the park but take note that this park is catered to kids but experience was a blast as we went there during their Halloween. Lots of zombie at night! You need to redeem the ticket at the Lotte World South Gate which is a bit of a walk from the main entrance but once there, everything is a breeze. Love the park but take note that this park is catered to kids but experience was a blast as we went there during their Halloween. Lots of zombie at night! klook offers variety of products. My fiance and I booked the ticket a week in advance in the cheapest price available that time. hassle free because no need to fall in line (little bit of challenge because not all of the attendant in Lotte world can speak English). Amazing, we will definitely book another one for Japan! Cheers. klook offers variety of products. My fiance and I booked the ticket a week in advance in the cheapest price available that time. hassle free because no need to fall in line (little bit of challenge because not all of the attendant in Lotte world can speak English). Amazing, we will definitely book another one for Japan! Cheers. Easy to use! And we don't need to queue! Great deal! Cheaper than the others found online! I'm happy with the purchase! Easy to use! And we don't need to queue! Great deal! Cheaper than the others found online! I'm happy with the purchase! Long lines for best rides but it was worth it. Easy to get the tickets at the group admission at the south gate entrance. Long lines for best rides but it was worth it. Easy to get the tickets at the group admission at the south gate entrance. Very convienient. Just present your voucher, no need to experience long queues. Very easy to use. Very convienient. Just present your voucher, no need to experience long queues. Very easy to use.